Dugi Otok (Long Island in english) is the largest island in Croatia and only an hour and 40 minutes away from Zadar (ferry port Gaženica) by Jadrolinija. 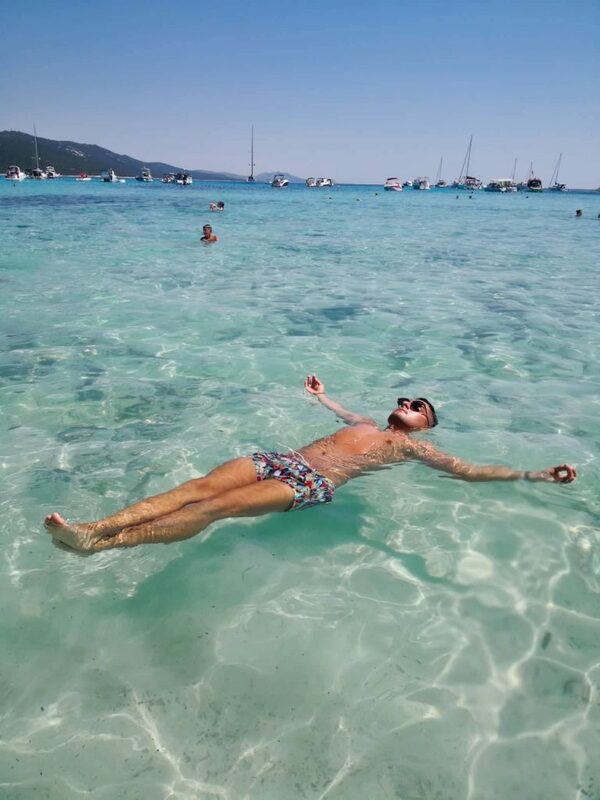 Dugi Otok is branded as “Adventure Island” but really suits any type of traveller, there is something for everybody, even those looking for some peace and quiet far far away from Croatia’s typically crowded beaches. Whether you’re looking for a sneaky day trip away from Zadar city or an extended island getaway, Dugi Otok is the ideal place for some R&R. 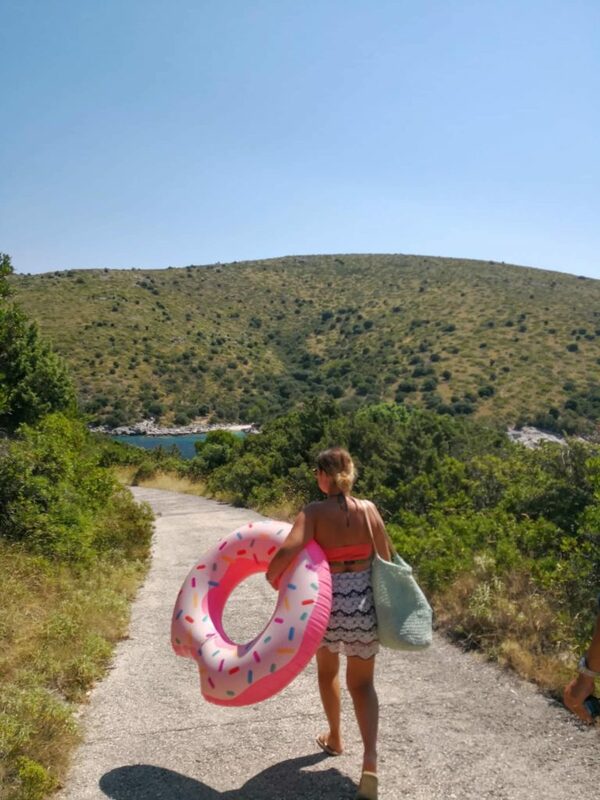 With my little sister in town from Sydney, Luka and I decided there was no better way to escape Zadar’s busy city centre than to take a day trip to Dugi Otok. 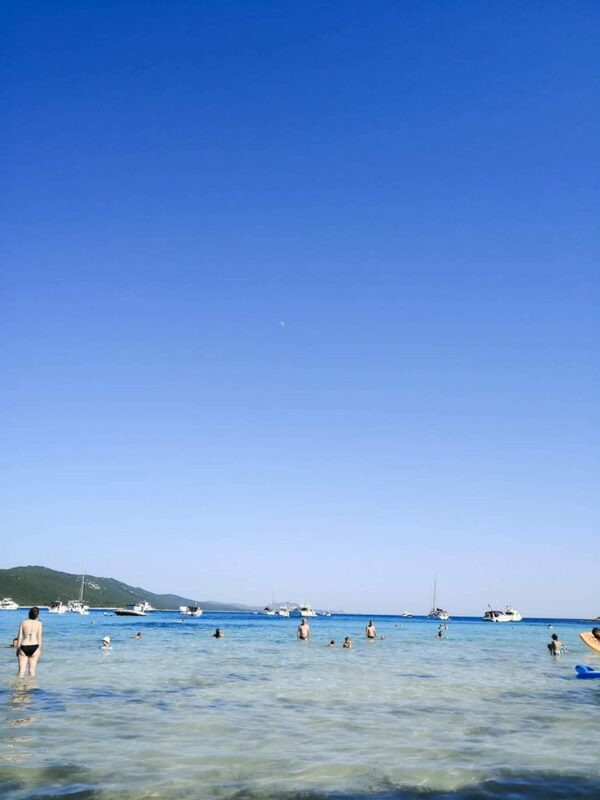 It wasn’t my first time on this island in the Zadar Region, I visited Nature Park Telascica with Croatia Full of Life last September so I was aware of the allure of Dugi Otok. Dugi Otok is easily accessible by island hopping day tours but on this particular trip, we wanted to take the ferry over with our car. The last thing we wanted to do was wait for a bus to take us from location to location on the island, especially in the summer heat. The Jadrolinija from Zadar Gaženica to Brbinj Dugi Otok costs 30kn (4€) per person (adult) for one way and to take the average 5 door car is 160kn (22€) one way. Return tickets for 3 adults plus a car were 500kn (68€). Our ferry left at 8am on the dot and arrived in Brbinj at 9:40am. One thing you’ll learn about Jadrolinija is that it’s super efficient, probably the most efficient thing in Croatia. 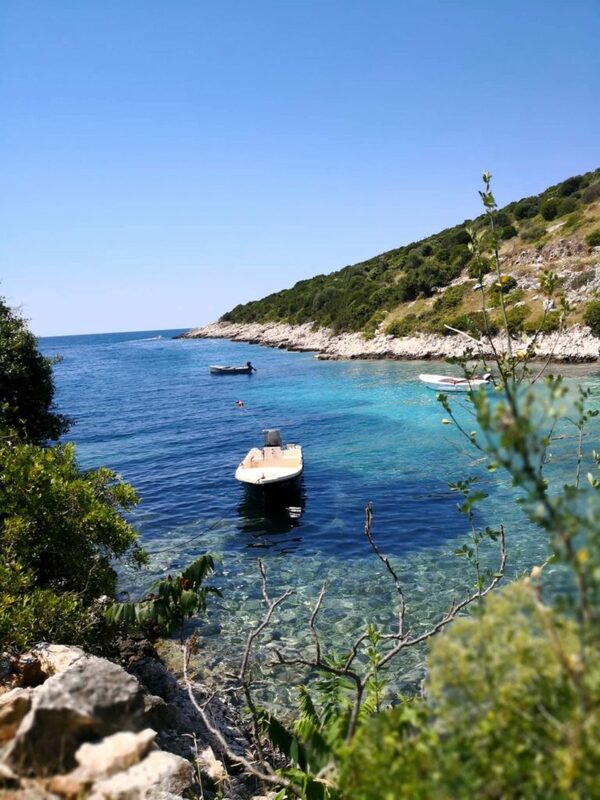 We set our sights on Sali and getting there is about a 25minute scenic coastal drive, under the impression that it’s somewhere close to Uvala Brbiscica, one of the hidden secret beaches on Dugi Otok. 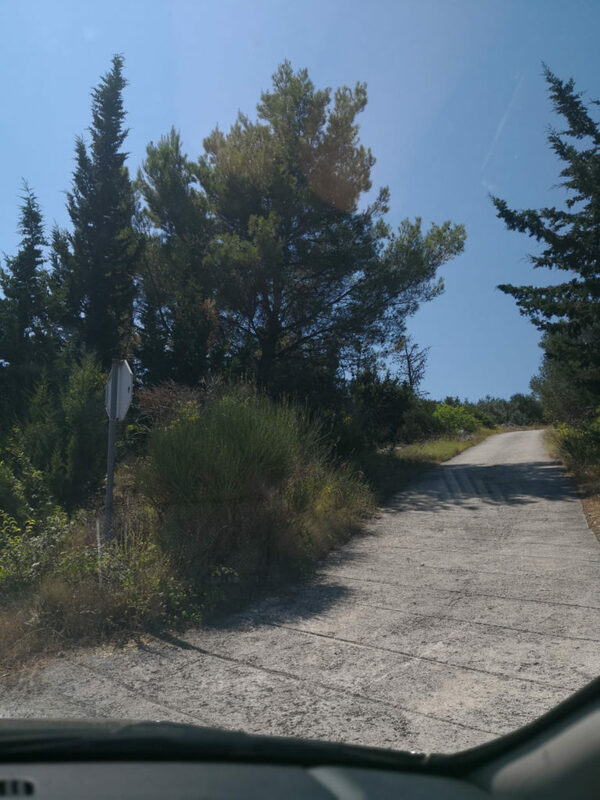 After a brief visit to the Dugi Otok Tourist Board Office, I learn that once again, Google maps has lead me in the wrong direction. We still take a seat and have a coffee in a cafe overlooking the marina, this is still Dalmatia and we have all day! We head back towards Brbinj from Sali and closer to the right turn we look for a tiny street on the left to turn into that will lead us to our secret beach paradise. How to get to Uvala Brbiscica? You look for this tiny concrete opening that’s surrounded by trees. It’s easy to miss to as you are approaching the turn off for Brbinj, slow down. The entry to this one way road is about 10 meters away from the exit or entry for Brbinj ferry port. If you’re heading out of Brbinj towards the main road in Dugi Otok, this small path is located 10meters on the right in the direction of Sali. If you’re coming from Sali and towards Brbinj, this road will be on your left. It’s a very small one way road and you may encounter a car coming toward you in the opposite direction. Drive safely around the bends as this road is a one for all and it’s the last place you’ll want to have an accident in. First timers visiting Uvala Brbiscica will most likely park at the final bend where the road turns into gravel but here’s some insider information, there is room for you to park your car right down at the bottom, closer to the secret beach. Picture perfect Uvala Brbiscica on Dugi Otok! 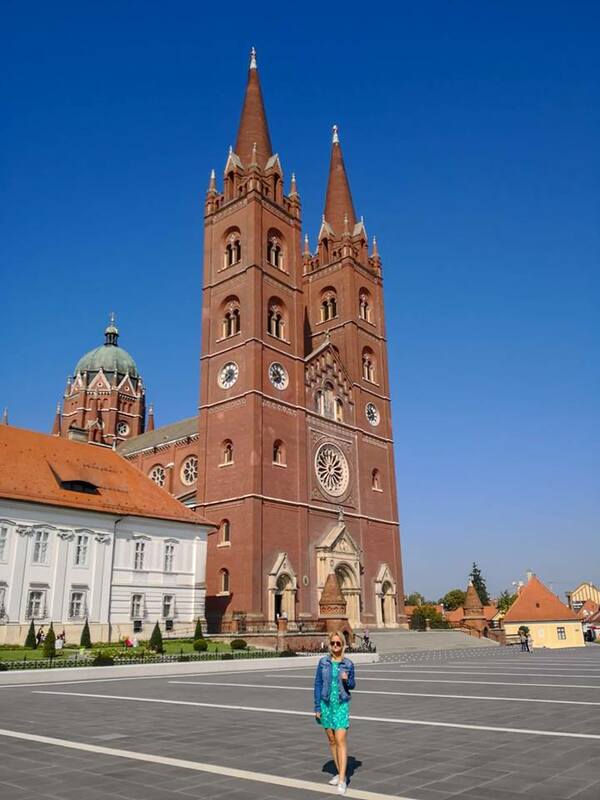 The beauty of Uvala Brbiscica is that it’s somewhat empty, only a handful of people know about it and visit. Also note that there are no restaurants, you’ll need to bring your own food or eat at another location on Dugi Otok. This secret beach is also very popular for kayaking tours and if you’d like to experience the Zadar Region this way, I recommend Kayak Tours Croatia. 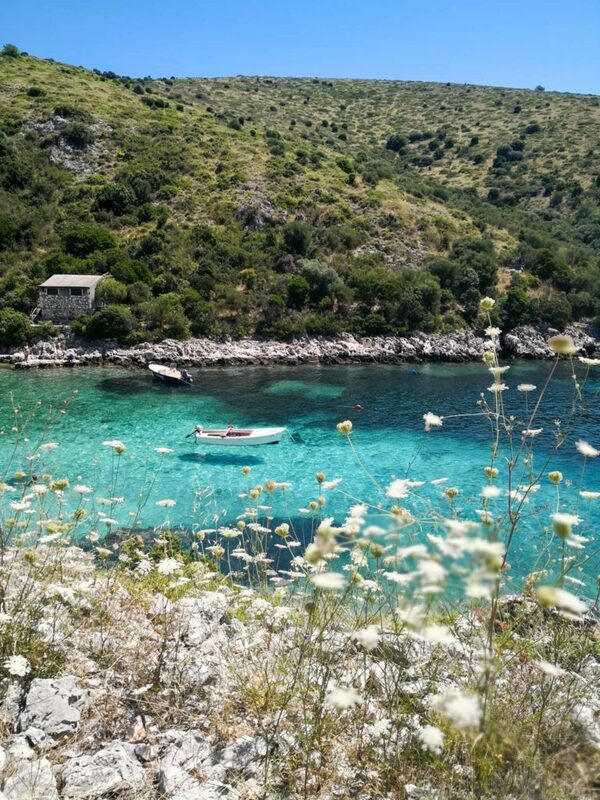 Check out the video by Go Mary & Coco, makes me fall in love with Croatia further. 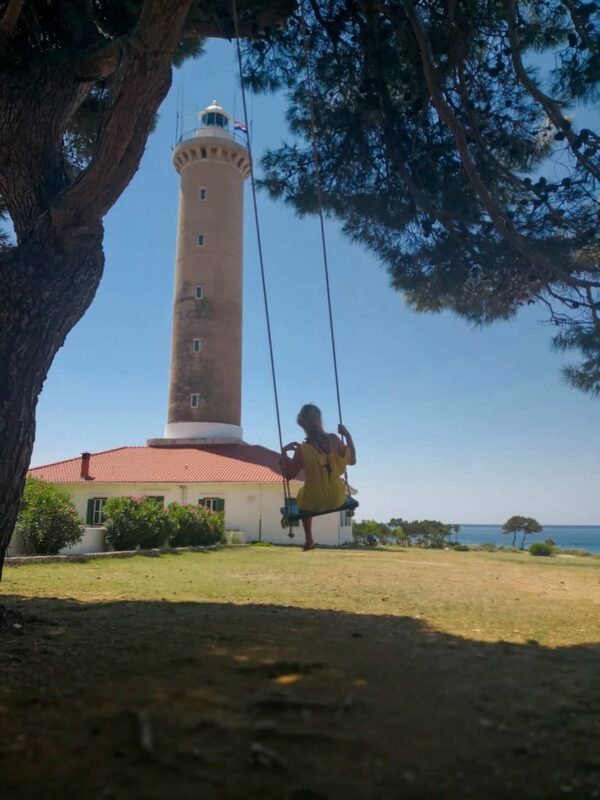 Our next stop is Veli Rat Lighthouse which is a 20minute drive further north on Dugi Otok from Uvala Brbiscica. It’s quite easy to get to and there is proper signage on the road to get there. Make sure you follow the signs to Veli Rat Lighthouse and not just Veli Rat. Veli Rat Lighthouse was built in 1849 and is 49m high, making it the highest lighthouse on the Adriatic. There are also two swings, one facing the lighthouse for you to enjoy and capture the perfect moment! There’s also a popular campsite nearby called Camp Kargita. Next we head to what is considered one of the most famous beaches in Croatia. The amount of global PR this particular beach receives in the Zadar Region is immense. Sakarun Beach is not more than a 15minute drive from Veli Rat Lighthouse and the entry will appear on your right if you’re coming from there. Many people park on the main road to avoid having to pay for parking. Parking costs 10kn per hour and will mean you’ll avoid having to walk up and down a dirt path to get to and from the beach. Sakarun Beach is known for it’s crystal clear blue waters and without a doubt, taking photos here that trend is not that difficult. The water is quite shallow and for once you won’t have to worry about stepping around on stones, Sakarun Beach is all soft sand. It’s a very family friendly beach. You’ll also notice a number of yachts further out at Sakarun Beach who dock for a couple of hours and enjoy the crystal clear blue waters, I’d probably revisit the beach that way next time and not by car. The only downside to Sakarun Beach is that there are no official restaurants that provide decent food but rather a fast food joint where you may have to wait up to an hour to get your order if they’re busy like we did (3x hot chips and grilled squid costing a ridiculous 170kn all up). Sakarun Beach has a lot of room and opportunity for investment.
? Awesome blog ? 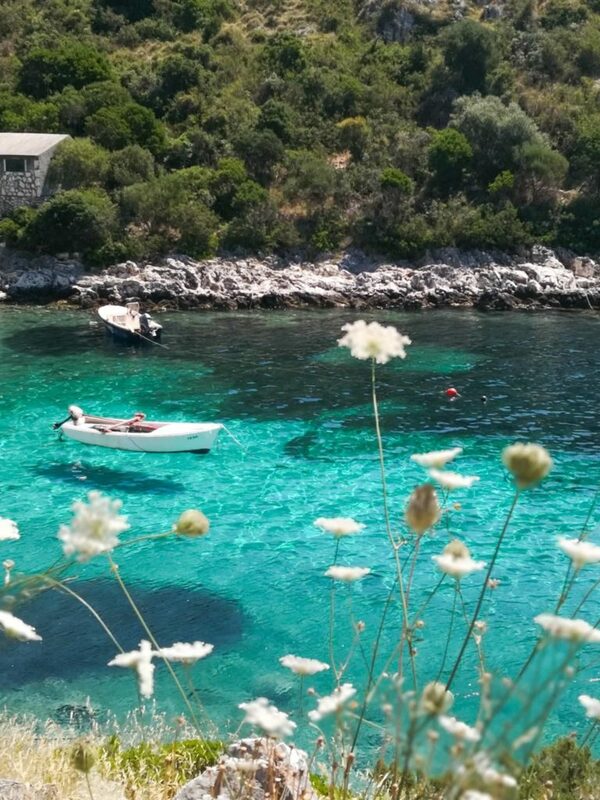 Thank you for sharing awesome tips around the beautiful Croatian islands ?